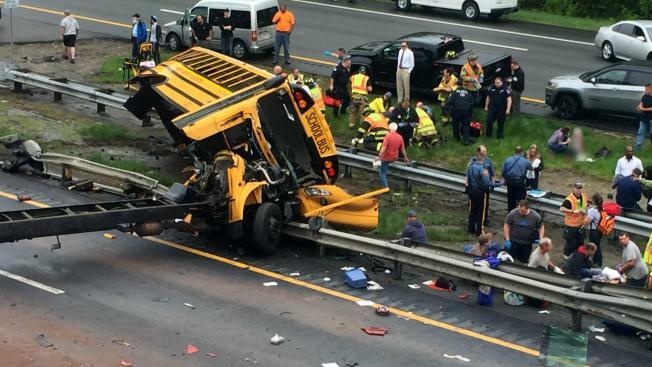 The 77-year-old school bus driver from the deadly May 17 highway crash in New Jersey had a lengthy history of license suspensions and moving violations, a spokeswoman for the Motor Vehicle Commission told News 4. Jen Maxfield reports. The 77-year-old school bus driver from the deadly May 17 highway crash in New Jersey had a lengthy history of license suspensions and moving violations, a spokeswoman for the Motor Vehicle Commission told News 4. Investigators are still probing the cause of the crash, which killed a 10-year-old student and a teacher after the full-size school bus collided with a dump truck on Route 80 near exit 25 in Mount Olive Township. Video from a Department of Transportation camera shows the school bus filled with fifth-graders making a sudden U-turn in a median, sources have told News 4. The bus, which was carrying 38 students and seven adults from East Brook Middle School in Paramus, was heading to a class field trip to Waterloo Village, a historic site in Stanhope. The driver, identified as Hudy Muldrow Sr. first got his license in 1975. He had a total of 14 license suspensions, eight speeding tickets, a careless driving ticket and a ticket for an improper turn in 2010, the MVC spokeswoman said Tuesday. Muldrow remains in the hospital and was unavailable for comment. The most recent suspension was from Dec. 20 of last year to Jan. 3 of this year for unpaid parking tickets. It was not clear if Paramus officials knew of that suspension; the district was not immediately available for comment. The driver had a commercial driver's license issued in 2012 and got the school bus endorsement on his commercial driver's license in 2013, the MVC said. The lawyer representing the family of 10-year-old Miranda Vargas, who was laid to rest Monday, sent a notice of tort claim to the Borough of Paramus and the Paramus school board Tuesday, indicating the family plans to sue. The lawyer is questioning whether the Paramus Board of Education did proper diligence in hiring a driver with his record. Funeral services for the teacher killed in the crash, Jennifer Williamson-Kennedy, will be held Thursday morning.